On Independence Day, we heard the PM saying that his government’s motto is to reform, perform and transform. 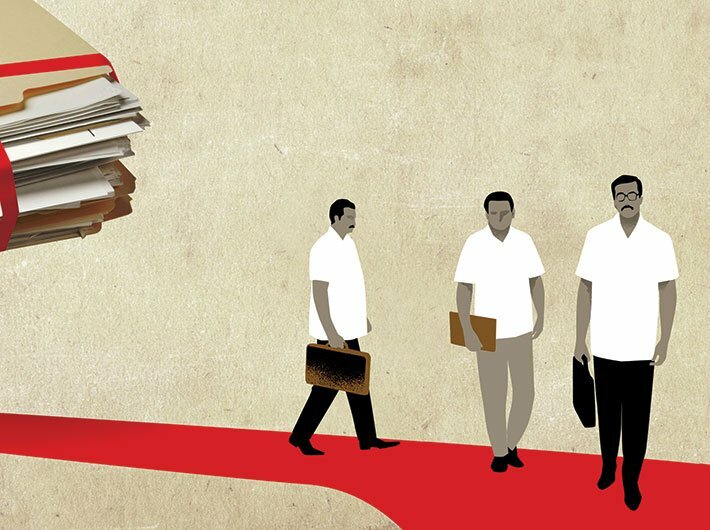 Also, on September 1, Carnegie Endowment for International Peace wrote, “India’s economy has grown rapidly in recent years, but the country’s bureaucratic quality is widely perceived to be either stagnant or in decline.” It is time to relook at overhauling the bureaucracy, if Modi’s idea of India is to be realised. We need speed, efficiency and effectiveness in our entire chain of command. We have had a mixed bag of experience of the bureaucracy in implementing some of the PM’s key announcements and the commitment on budget announcements and schemes. 1. Unlike the politician, who has to go to the electorate every five years seeking ‘votes’ as his ‘appraisal’ for the performance, bureaucrats come with a ‘seniority based promotion’ and a defined retirement age and hence, they are least bothered for their performance reviews and also that these ACRs (annual confidential reports) for performance reviews can be ‘managed’. 2. Also, since bureaucrats make the ACRs of these bureaucrats, the norm is ‘do no harm’, and they are generally rated between 8-10 in the ACRs and the chain continues year after year. Actually, now there is no merit in looking at these ACRs. Even the most corrupt and inefficient had the best of ACRs. 3. Most of the bureaucrats are there for ‘authority’ and ‘administration’, and not development. Their approach is to ‘control’ and ‘govern’ and not ‘work as a team’ for ‘development’. 4. Also, if one gauges the real working of majority of these bureaucrats, they don’t work for anyone, but they work for themselves, and then, there are egos, differences, grudges and dislikes for other bureaucrats. So there is never a team approach in whatever they do and this drags the performance of the government. 5. Bureaucrats are more ‘procedure driven’ than ‘outcome driven’. That is why files take months to travel from one desk to another. Nitin Gadkari, one of the best performing ministers, famously said on May 9 that he had to wait for nine months for approval for an automated parking. This is when Gadkari is known for being fast in getting things done within the bureaucracy, and we can imagine what other ministers must be facing! So, the time has come to think out of the box and overhaul this system. Else, in 2019, the government’s biggest failure will be because of the inefficient and unaccountable bureaucracy who will fail to implement the government’s key schemes. We need to focus on the team approach, ‘One India, one team, one goal’, that touches and transforms life till the last man standing in the line. Weightage for each level of review for the comprehensive performance review (CPR) should be as follows: IPR (50%), DPR (25%) and GPR (25%). Increments, variable pay/ incentives and promotions of officials should be based on CPR. The government works for the citizens, and finally it is the citizens who are the best judge of its performance. The above parameters can be objectively judged with data/facts, and others can be subjectively judged by the citizens under Jan Bhagidari Assessment (JBA) through online voting. At the end, it is the government ‘for the people’; so the people must rate the government on overall performance through public voting after the government presents its self-appraisals on the above parameters. Major change in bureaucracy is about making it a ‘performance-based contractual service’. Also, one reaches the rank of joint secretary after a minimum service of 17 years. A joint secretary is the actual ‘official’ who runs the show for the government on a day-to-day basis, but if one sees the performance of the joint secretary, in a real sense, he does not feel accountable to anyone. The reality is that now they are more driven by authority and administration and less by duty and development. The biggest bane of bureaucracy is their job security. Let us give them job security, but for performers. The government is serious about a ‘big change’, and has to go and seek appraisal from the voters in 2019, but most of the bureaucrats are not as serious. They have been used to seeing government after government for decades. For them, this is all routine office work but for the government, it is an implementation emergency. This is the only way to bridge the divide and bring about a cultural change for performance, accountability and rewards. Today, only politicians are accountable but not bureaucrats! And it is time to change and fix the accountability based on a transparent review process/system. All officers of the rank of joint secretary and above must be put on a five-year contract, based on their performance review along with a performance-based financial incentive. So, the salary structure should have a fixed pay and a variable component. If they fail to live up to the performance standards (IPR) – below 80% for three out of five years – they must be relieved. Let us not forget that the ‘best are first to be hired and last to be fired.’ So the best performers need not worry. Even Nirmal Kumar Mukarji, the last serving ICS officer who retired as cabinet secretary in 1980, as chief guest at the IAS’s 50th Anniversary celebrations 1997, had called for an end to the all-India tenured services. Also, PS to the union ministers should not be an IAS. PS to the minister is considered an important bureaucrat but he is a junior IAS. (PS to the minister is below the rank of joint secretary), and hence he plays safe dealing with his seniors, as one day he might have to work under them, and the loser in this case always is the minister. So, we need to consider that the PS to the minister should be in the special secretary rank. Files are taking months to move from one table to another. The e-Office/e-File concept must be implemented. No file should take more than three weeks and more than three levels. If there is a delay of more than a week, a note should be made on the file justifying the reasons for delay. Modi has the intent, the will and the vision and he is working hard. Will his administrative system be able to catch up? There is a big difference in how the minister and the common man are handled by the bureaucrats. So the first impression here should not be the last impression. Bureaucracy is slowly putting red tape to the red carpet! Modi said recently, “We cannot march through the 21st century with the administrative systems of the 19th century.” We still have ‘collectors’, and this shows the bureaucracy is still in 19th century. A senior IAS wrote to me, “Modi is ahead of time”, and I said “Yes, Modi is definitely ahead of time but unfortunately, the bureaucracy is still in the 19th century.” When Modi was thinking of the planning commission, he made a profound statement, “Sometime it is better to build a new house than to repair the old one.” Maybe, the same approach is needed for the ‘institution’ called bureaucracy. Do we repair the old house and/or build another? The transition is critical and we have no time to lose. It needs to start soon and there should be a time-bound plan to implement it. Gupta is a public policy expert.